A two-run homer. University of Virginia defeats Georgia Tech, May 13, 2016. But, jubilation probably deserves a little more. How about a bases-loaded walk-off walk win? 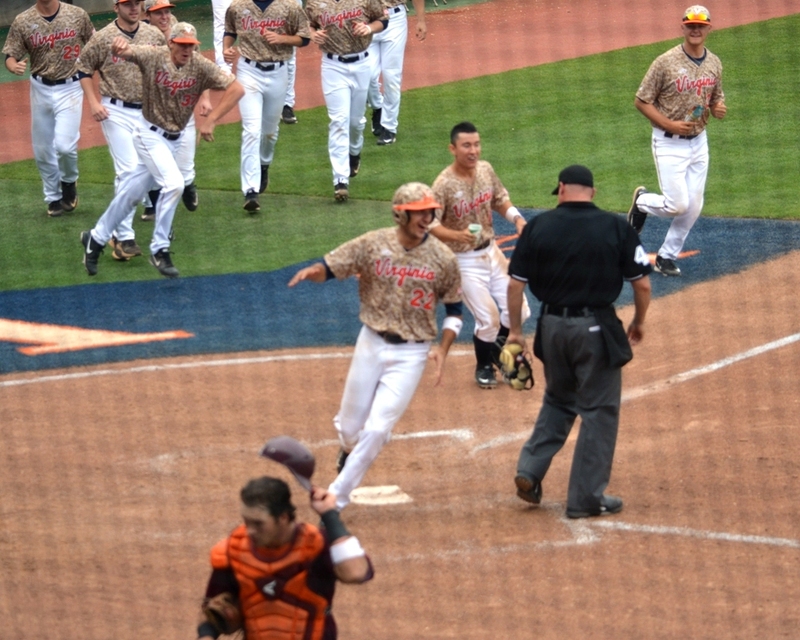 University of Virginia defeats Virginia Tech, May 20, 2016. 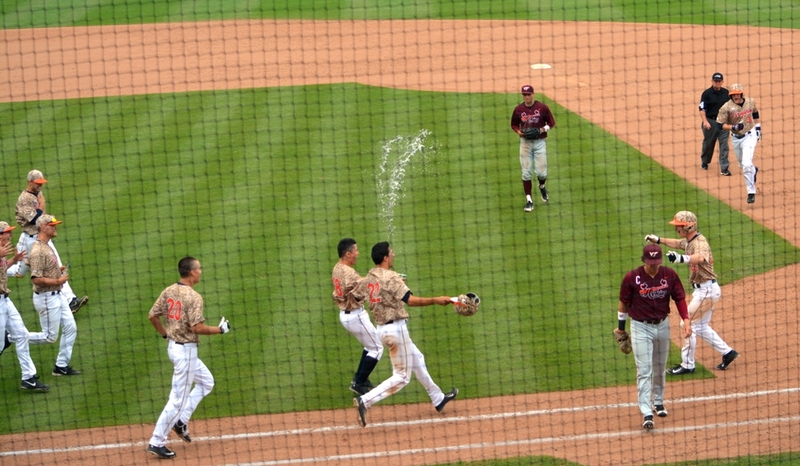 Baseball jubilation often includes a Gatorade shower – a couple cups tossed in the air will do in a pinch. The NCAA college baseball post-season, and the road to the College World Series in Omaha, begins tomorrow. 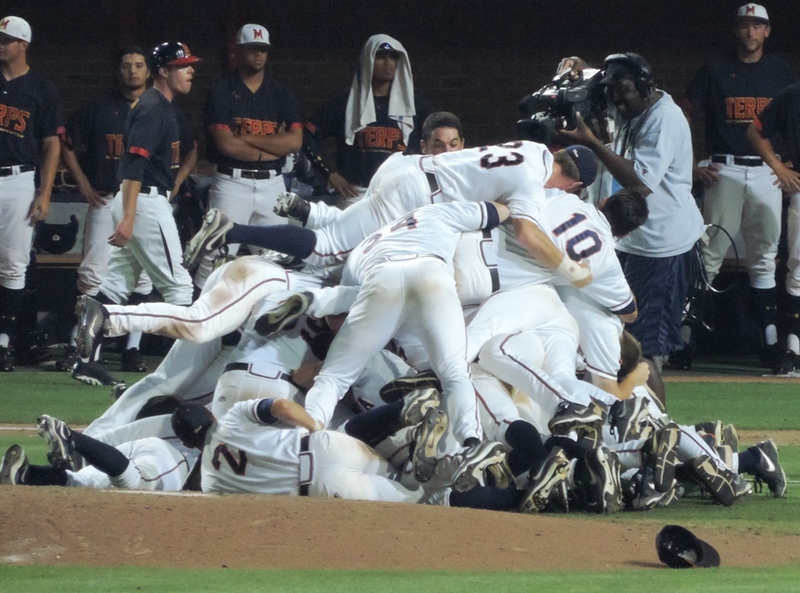 There will be plenty of dog piles over the next five weeks. University of Virginia over University of Maryland. Super Regionals, 2014. In response to the Word Press Daily Post Photo Challenge: Jubilant. See more challenge photos here. This entry was posted in Baseball, University of Virginia and tagged Justin Novak, photography, University of Virginia, Weekly Photo Challenge by Jackie, The Baseball Bloggess. Bookmark the permalink. Keeping my fingers crossed that jubilation here will last through the next five weeks. Those are the best games! Such great memories in the last innings – come from behind or solidify the win with 1 more! Great pics of those winners! Thanks Sharon! 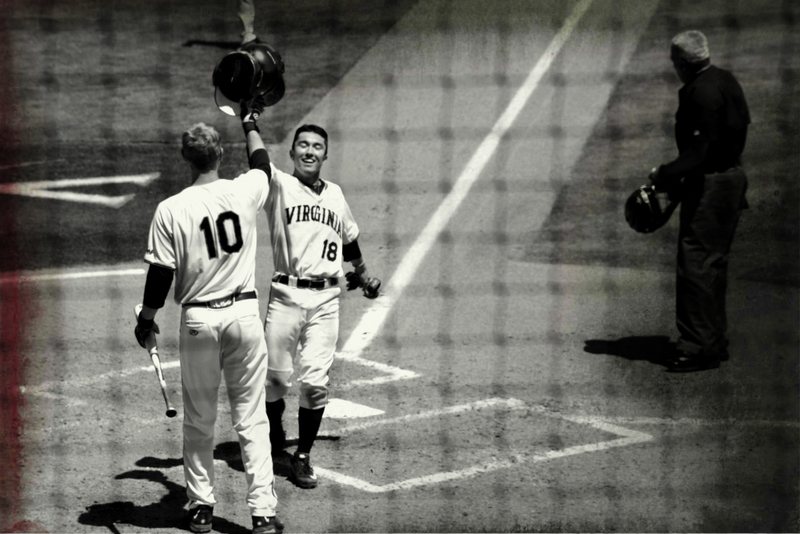 That walk-off walk was a hard one … the ‘Hoos let a laugher of an early lead get away and nearly lost the game. I think the jubilation of those walk-off photos was actually relief that they squeaked out a win and wouldn’t have to live down an embarrassing loss to Tech. Sports are always ending in Jubilations! And, as Newton’s 3rd Law reminds us — for every positive action there is an equal and opposite reaction. So for every jubilant team, there is always the unhappy team who has just been beaten. I think sometimes the photos of those who have lost are more poignant and powerful. That photo of the walk-off win isn’t a very good photo — the net is in the way, I’m out of focus — but I really like it because you can see the catcher leaving the field, unhappy that his team let an important game get away. It shows your enthusiasm clearly about the Sports! And liked the way you observe the photo scene! The last photo’s the best; makes me want to see more of your work. 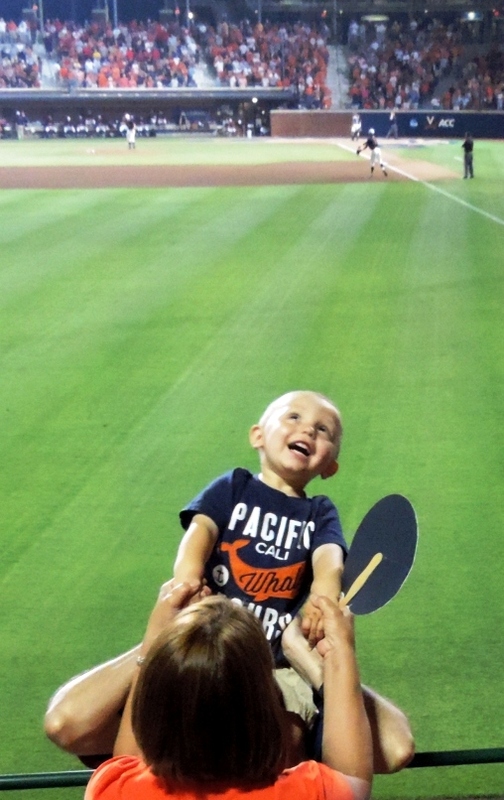 Yes, I love that photo of that little fan, too — such joy! It’s a good reminder for me that sometimes the best photos at a game aren’t always OF the game itself. Thank you for stopping by and for your kind words … I’ll check out your blog, too. I’ll be tracking the Road to Omaha pretty closely from now on! Best of luck to Virginia in the ACC tourney (unless they face the Cards lol!). I think college sports have a special feeling to them, it’s more of the kids playing for their team/school then for money. Welcome to the ACC, Mike! :) Virginia is in Louisville’s bracket. I think we were happy to sneak in as the ACC #3 seed (much better than last season’s “play in” position), but not happy that it means being placed with L’ville. The battle of the ‘Villes, perhaps! And, you’re right about college baseball — when we first started going to Virginia games it was simply to get some baseball in, because big league ball is too far away. But, now I’ve flipped — last season we skipped a planned trip to some Orioles games (something I never thought I would ever do) so we could be at Virginia’s unexpected Super Regionals games. It was then that I realized how much I love college ball. Good luck to your Cardinals (except, of course, against the ‘Hoos!) … Louisville looks very tough. Lots right over there. Always. Btw, didn’t Newtown develop that theorem watching a double header from the left field bleachers?